Rethinking the Asian American Movement is a much-needed and elegantly rendered volume. Students of the Asian American Movement—and, indeed, of all social movements—will surely find Maeda’s book an exciting new addition. 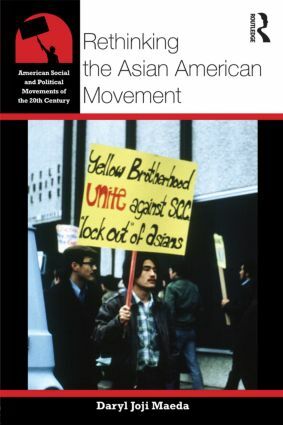 Maeda provides an insightful account of the Asian American Movement from 1968-1980, clearly explaining the diverse ethnic communities, regional organizations, and particular political perspectives that constituted the movement. This overview is an important contribution that will be of value to students of social movements and US social history in American Studies, Asian American Studies, Ethnic Studies, and Women's Studies. Daryl Maeda’s Rethinking the Asian American Movement is an impressive study that brilliantly dissects the origins of a political movement from the activists and their ideologies to the structural dimensions that influenced their organizational strategies and activities. His critical analysis of coalition-building between racial communities at both the national and international arena reshapes our understanding of social and cultural transformation during the 1960s and 1970s. Daryl Maeda crafts an ambitious, accessible study of one of the least known and least understood social movements of the 1960s and 1970s. He details the work - and relevance - of dozens of grassroots organizations whose incredible efforts have left a palpable mark on Asian American communities, politics, and culture. A wonderful contribution to the emerging literature on Asian American radicalism and social movements. Daryl Joji Maeda is Associate Professor of Ethnic Studies at the University of Colorado, Boulder.